There’s a room on Logitech’s bright, modern-looking campus in Lausanne, Switzerland full of contraptions specifically designed to torture PC hardware. Pneumatically-powered metal rods insistently click on mouse buttons and clack on mechanical keyboards, faster than any human hand. One machine hammers keyboard keys 6 times a second, endlessly, testing that they can withstand the millions of presses that Logitech sets as a performance benchmark. You could hammer these keys 6 times a second for 10 hours a day for 2 years before they’d give out, an engineer tells me. Other things that Logitech has done to “test” its keyboards and mice include: driving trucks over them, dropping them from great heights, strapping them to strange turntable devices that spin around and around at crazy speeds to test their pinpoint accuracy on different surfaces, fixing them to the end of a pneumatic metal arm that swings wildly from side to side. I feel weirdly sorry for these peripherals. 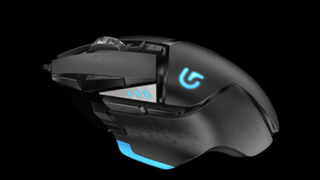 All of Logitech’s pro-gamer products look and sound like they belong on a spaceship. They’re all glowing blue lines and angular black plastic, with names like Daedelus Prime, Proteus Core and Hyperion Fury. It’s a very aggressive, rather teenaged aesthetic, evidently popular both with the professional eSports players who use them and the people who buy them as a result of their endorsement. To me, as a casual observer, they seem absurdly ostentatious products, and astonishingly technically advanced. The latest gamer-oriented keyboard, the G910 Orion Spark (see what I mean? ), involves more then 360 different LED lights, filtered through a micro-lens in every key so that each can be programmed to pulse a different colour. It costs £159 ($250). They also cost millions to develop - I couldn’t get an exact figure out of any of Logitech’s staff, from the R&D supervisor to the head of their games division, but when you spend a year working on a new mechanism for a mouse click or keyboard key and a fortune inventing contraptions that torture keyboards and mice to within an inch of their lives for testing, the costs start to add up. According to its latest financial report, Logitech spent over 16% of its gross profit on research and development in the six months from March to September this year: over $63 million. That figure covers all of Logitech’s business, but the company’s high-end keyboards and mice are likely to be a large slice of that R&D cost, because Logitech’s engineers evidently care a great deal about making extremely good PC peripherals. In addition to the Room of Tortured Hardware, Logitech’s Swiss campus contains this insane room, designed to filter out all signal interference to test wireless mouse response times. This room cost 550,000 Swiss francs (£362,000, $571,000). The equipment outside, which precisely maps the radiation that the isolated mouse emits, cost a further 250,000 Swiss francs (£165,000, $259,000). After hearing that, and watching several deeply technical presentations on Logitech’s newest keyboard’s key mechanism (which is a new invention), my biggest question was: how on earth can that be worth it, financially? eSports players are a vanishingly small percentage of even the PC gaming market, and their needs often conflict with those of the general mouse/keyboard-user. Pretty much nobody else spends 8-10 hours a day playing video games with intense speed and precision, and these mice and keyboards are so optimised for games that they’re not exactly ideal for more general use (the elevation of the keys, at one point, actually made them impossible to type on quickly - something that Logitech had to fix before production). With such a teensy potential market, how is spending millions on a mouse worthwhile? Logitech is a very solvent company, it seems, so spending these astronomical amounts on new products is something it can afford to do even if the profit margin isn’t all that great. Presumably, many of its other, less demanding products - iPad cases, portable speakers, more normal mice and keyboards - make enough money to allow for it. But I get the impression that these things are passion projects for a lot of the people who work on them. Logitech is an extremely nerdy engineering company, at heart. It’s spent 33 years making mice. The people there take pride in making the best ones. I don’t think I could personally bring myself to actually purchase and use a £70 ($110) mouse called Proteus Core, but there is a large and growing population of people who definitely would: not just eSports players, but eSports fans. You could make an apt analogy with sports equipment here; sure, nobody apart from professional tennis players actually needs an ultra-light-weight tennis racquet with three years of R&D behind it, but people buy it because that’s what the pros use. Logitech sponsors eSports teams for precisely this reason. The scene from League of Legends’ Worlds tournament. When you look at photographs of stadiums packed with rapt people watching top MOBA and FPS competitors - a scene that has appeared almost from nowhere over the past 4 years or so - you might see a phenomenon, but I reckon Logitech sees a market. Some research puts the eSports viewing audience at more than 70 million people. Perhaps spending seven-figure sums on making mice and keyboards for their heroes to use isn’t such an indulgent thing to do. Disclosure: Logitech provided Kotaku UK’s travel and accommodation near its campus in Lausanne, Switzerland.